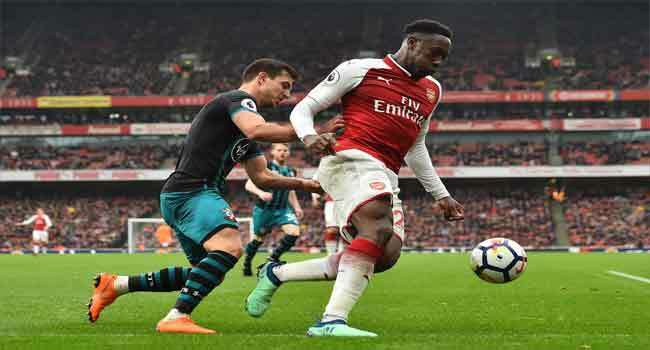 Southampton’s Danish midfielder Pierre-Emile Hojbjerg (L) vies with Arsenal’s English striker Danny Welbeck during the English Premier League football match between Arsenal and Southampton at the Emirates Stadium in London on April 8, 2018. Arsenal forward Danny Welbeck remains in hospital after suffering a “significant” ankle injury during his side’s Europa League clash against Sporting Lisbon, the Premier League club announced on Friday. Welbeck was stretchered off during the first half of Thursday’s 0-0 draw with what looked like a bad break, his foot twisted backwards after landing awkwardly when going for a header. Arsenal plan to wait several days to determine the exact extent of his injury before releasing more information. “Danny remains in hospital and will continue to be assessed. A further update will be issued over the next 72 hours,” a statement on the club’s website read. Former Manchester United star Welbeck was injured when he challenged for a header against Sporting, leaving him crumpled on the turf in obvious pain. Many of Welbeck’s team-mates appeared distressed as he received lengthy treatment and was given an oxygen mask before being carried off. Arsenal manager Unai Emery admitted after the match that Welbeck’s injury had been a huge blow to the rest of the team. “He was working well and he was having a good match,” said Emery adding the other players swiftly realised the grave nature of their teammate’s injury. Welbeck’s injury looked so serious at the time that some pundits speculated that he may not return to action for months. It is a bitter blow for Welbeck, who had just been named in the England squad for their forthcoming matches against the United States and Croatia. “He’s a very good person. His commitment with us is very big. He’s helped us with his behaviour, with his quality and his capacity,” Emery said.